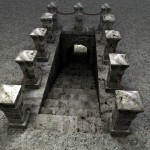 Dungeon Stairs 3D RPG style dungeon mapping models make it easy to set up stairway scenes or link together your dungeon levels. 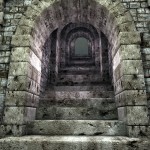 Get Dungeon Stairs by itself or as a part of Dungeon Depths: The First Level Complete Edition. You may be asking at this point, what’s so special about stairs? 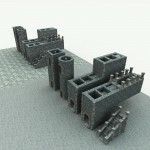 In this model set, you get two spiral staircases, which are completely extensible for any depth of dungeon. 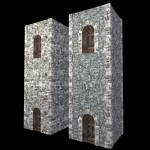 Each spiral staircase has doors and, forms a complete environment for your art. 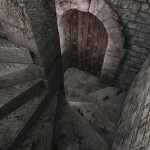 You get a level-to-level staircase, allowing passage from one level up a steep flight to the next level; similarly, you get a level-to-floor staircase, with a lower entry doorway that goes up a fight of stairs up through the floor of the next higher level. 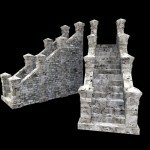 Finally, you get standalone stair that you can include within larger rooms. 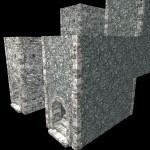 Combine with the Halls, Walls and Doors model set, and you can create a two level chamber with stairways within. 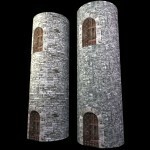 This model set also features the dungeon and natural texture sets, complete with normal and bump maps. Each staircase is an environment. Floor to floor archway staircases.